Google News Adds "News for You" & "Recommended Sections"
Google News announced that the home page is now more personalized for those who are logged in to Google while using it. 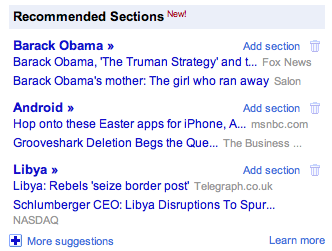 Google added two new sections, one named "News for You" and the other a side widget named "Recommended Sections." 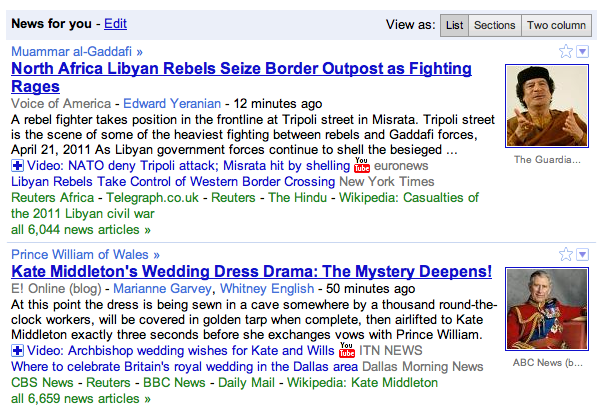 The "News For You" include stories based on your news-related web history. Basically, Google knows what you search for and click on, and it will tailor the content within that section for news that you tend to click on more. The "Recommended Sections" on the right hand column is similar in functionality but placed on the side bar. Note, this is only available to English-language U.S. edition of Google News only.